Today everyone can own drone and more people are taking to the skies than ever before. Consumer drones let you go to places where no one has gone previously—at least not with a camera. Maybe you want a career as a drone aerial photographer? Or perhaps you just want it for personal reasons. There are lots of affordable choices out there and my guide can help you choose. This page looks at the best quadcopters with quality cameras. Before we get into the top 9 drones, we’ll look at what a quadcopter is — exactly — and why they’re the best choice for aerial photography. This introduction explains what to look for in a camera drone based on budgets and expectations. By the end of this short intro, you’ll be in a much better position to make a well-informed decision. Long flight time, perfect beginner craft, and nice flight modes. GoPro compatible and has control apps for iOS & Android. This has full FPV Support and an obstacle avoidance system. 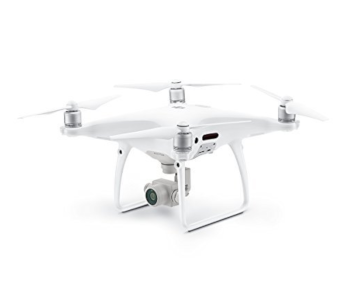 You can buy different types of consumer drones – also called unmanned aerial vehicles or UAVs. Some are tiny toys used solely for fun flying. Others are high-speed crafts that enthusiasts love to race. 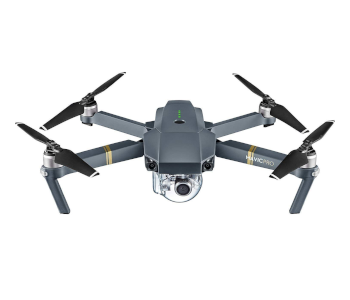 In this guide, we focus on the UAVs best suited for stunning aerial photography and high-quality filming. We also view drones with integrated cameras (built in) and attached (not built in). It’s the quadcopters we focus on here. These 4-engine UAVs lift off vertically and are incredibly stable flyers. Their stability makes them brilliant crafts for stills photography and for recording video. Like the crafts, drone cameras come in all sizes and offer varying features, functionality, and quality. A drone with a fixed (built-in) camera has limitations over one with a mounted camera. Some drones don’t even come with a camera but they do have a mount. This can be useful because pilots have some choice over the cameras and optics they use for shooting. GoPro is a good example. This easy guide doesn’t assume you have any technical knowledge of drone photography and filming. Here are some of the technical terms used on the page that relates to cameras and footage. Ultra High-Definition (UHD): This refers to 4K (4096 x 2160) and is higher than HD. Having a good basic understanding of drone camera vocabulary is useful. It helps newbie pilots choose the right model — for them — and thus avoid any post-purchase disappointments. Be a little prudent with whatever category of camera drone you opt for. Look deeper than just appearances, the camera quality, and features. These things are important but they’re not everything. Not all things matter to all people. You may not want to be airborne for too long or fly your drone too far. Decide what you want and write it down. This will help you to make much better decisions. Okay, that’s about it. Enjoy the reviews on the best consumer camera drones available. Each review here talks about the drone, its qualities, and setbacks—if any. Aside from highlighting the photographic and filming capabilities, you’ll also get to discover the other important features. These include battery life (flight time), control range, and the controller. There’s a table at the end of each review as well. This draws attention to the main technical aspects along with any pros and cons. There’s something for everyone in this guide. At the top end, there’s one very worthy high-priced contender over $3,000. We then have a couple of camera drones over $1000. There are three in the mid-range in between $500-$1000, and four others under $500. For each category, I’ve arranged the quadcopters in order of Editor’s Rating. The best-ranked drones are at the top. Personal research, expert opinions, and user feedback, all help to form these reviews. The table below shows my top 9 picks of camera drones at the time of writing. From left to right there’s the name, type of camera, image resolution, and megapixels. Buying any drones higher than toy status can be quite an investment. Drones bundles costing over $5,000 are what all ambitious drone pilots dream of, yet only serious prosumers and professionals buy. This might sound like an unrealistic price tag for some. If you’re a professional drone pilot, though, it’s a tool of the trade and therefore worth every dollar. The one we have here is a very serious contender. You can get the drone without the camera bundle for around $3000. 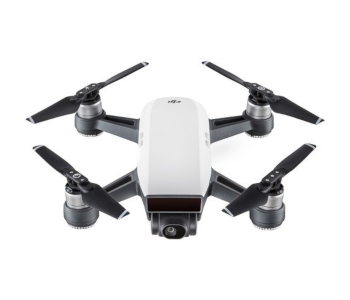 You can also consider the DJI Inspire 1 for a quality drone camera bundle for half the price of the latest model. 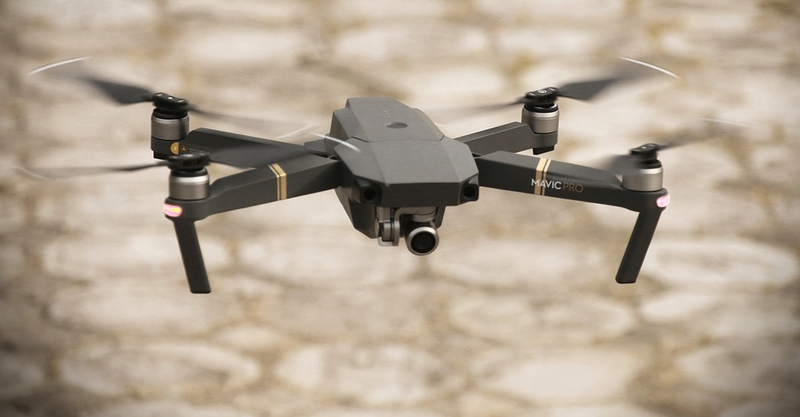 If you’re a fan of DJI, you’ll know that the Inspire 2 is an exceptional flying robot favored by supporters with deep pockets. Most buyers, though, are professional videographers and local news broadcasters. The craft is all pro-grade as you’d expect with a camera drone in this class. It’s a pleasure to operate and provides a very stable flight experience even at its top speed of 58 mph in Sports Mode. There are some reports of getting this drone to over 65 mph in perfect conditions. However, with high speed come higher risks. Obviously, you need clear space — and lots of it — especially for stopping. This is a UAV that’s pretty nifty even in standard flight mode (40 mph). 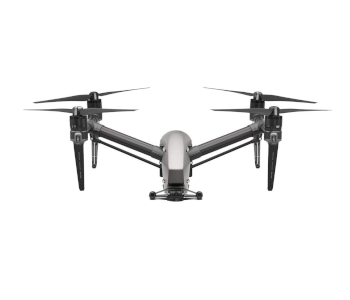 At optimal conditions, the DJI Inspire 2 gives you 28 minutes flight time per charge. Recharging takes a reasonable 1.5 hours. This flying camera has a few standard safety measures. Its Return-to-home feature is vital for a craft with a control range of 4.3 miles. It’s a safeguard in the event of lost or disrupted communication. There are plenty of bells & whistles to the DJI Inspire 2’s intuitive remote controller (RC). Despite this, it’s well-designed and simple to operate. This is an important point for drones that film as well as fly. It sounds cluttered but it’s not. New users will become familiar with the DJI Inspire 2 remote controller in no time. The RC clamp houses your mobile device which must have the DJI GO 4 app installed. The camera we looked at for this review was the superb Zenmuse X5S. It’s a tiny micro four thirds camera with an option to change lenses. It can capture amazing 5.2K video quality in CinemaDNG. For photography, you get to shoot stills at 20MP in both JPG and DNG formats. The camera’s removable stabilizing gimbal won’t let you down. It promises to keep all your footage crisp and clear during flight. This drone comes with the very latest DJI Lightbridge technology. Its effective broadcast distance sets this UAV apart. It’s a capable long-distance drone recording video in both 1080p/720p. An effective FPV function is a must-have with such a long control range. DJI have your back on that front too. The outstanding First Person View ensures greater pilot and camera operator collaboration. It’s possible to improve signal stability by choosing between two control frequencies: 2.4GHz and 5.8GHz. Which you use depends on whether you’re flying in urban terrain or clear open spaces. I think this craft is as near to perfection as you can get for a flying camera drone. However, 100% flawlessness is an impossible achievement. The gripes are minor but worth noting all the same. My first gripe is the limited camera compatibility. For most people the camera choices are more than enough. It would still be nice to have other options available, though. My second gripe is the high cost of the available cameras. I’m not saying we should have cheap cameras on a costly drone of course. But more affordable choices would certainly be welcome. On the whole, the DJI Inspire 2 is a quality piece of engineering. It’s a flying camera that does exactly what it says on the box. This is one of those rare crafts that should meet every pilot’s expectations. You get what you pay for in most cases. Even so, don’t let that discourage you. Although the camera drones over $1000 offer plenty, we still have some capable cheaper models to review. There are only two in this category, the DJI Phantom 4 and GoPro Karma, both worthy of the top slots. DJI target their Phantom 4 camera drone at the prosumer level but anyone who’s flown a quad before will get on well with this craft. It’s not cheap but it’s worth every penny if you’ve got the cash to spare. New pilots will love auto take-off and landing and the intuitive beginner mode. Being able to restrict flight speed and range (distance from drone to controller) are handy features. This drone offers a fast and stable 45 mph in Sports Mode. In optimal flying conditions, you get an impressive 28 minutes of flight time. That’s a lot more than many other models out there. capabilities of this popular DJI drone. The lens offers a 94° angle-of-view (AOV). This angle is not as wide as a fisheye. That’s a good thing by the way, as it means less distortion. But it’s wide enough to capture plenty of amazing footage. I like the fact that the propellers stay out of view for most situations, though not in Sports Mode. This is because it has to tilt somewhat to achieve its top speed, and that’s why the blades become visible. The Phantom 4 comes with a small mechanical gimbal. This does an amazing job of stabilizing the camera in flight, even in blustery conditions. This steady clear footage is one of its main selling points. The camera has a resolution up to 4k (Ultra High Definition) and impressive 12MP stills. Photos are available in popular formats, i.e. DNG RAW and JPEG. There’s also time-lapse and burst shooting. The camera can’t turn 360 degrees. Still, the craft flies so well it’s not difficult to get the shots and angles you want by moving the drone into the desired position. Whether you’re a keen amateur or a serious videographer, the Phantom 4’s video delivers on the cinematography front. You can capture DCI spec at 24/25fps and UHD 4K up to 30fps. There’s the full HD option too (1080 x 1920) that lets you record footage up to 120fps. This is useful if you want to create impressive slow motion special effects. Because of the taller motors, the props are invisible from most video footage. In sports mode, however, they can show in the video because the Phantom 4 has to tilt to achieve its top speed. You’ll need First Person View (FPV) if you want to put yourself in the pilot’s seat for the ultimate flying experience. This requires a pair of Phantom 4 FPV Goggles (not included). The popular follow-me mode actively tracks you or any moving thing that has the receiver. It’s a great feature for sports and action style photography in particular. The Phantom 4 has an intuitive remote controller (RC). It’s a high-quality wireless device, integrating a video downlink with an aircraft style RC system operating at 2.4GHz. If you’re familiar with the Phantom 3 Professional, the Phantom 4 is a decent upgrade. The Phantom 4 Pro has even more to offer, and there’s a full review of that in one of my other guides. Obstacle avoidance is a welcome extra feature. It’s not something that’s available on all drones just yet. Add to this the craft’s list of impressive specifications and its ease of flying. There’s a lot to like. The initial setup time can be awkward for some, and the user guide is not the best help. You may want to consider the high cost of spare batteries in your decision making too. Overall, though, this is an impressive flying camera. Anyone who has the budget for the DJI Phantom 4 should at least put it on their shortlist of options. The GoPro Karma Camera Drone goes for around $1,100. It’s also easy to setup and fly this little beaut, making at great choice for serious beginners as well as more experienced flyers. Newbies have the option to train on some practice routes in a virtual setting. The intuitive flight simulator steers you through the drone’s basic operations. This is a major advantage for novice pilots. The Karma’s a very capable craft and a stable flyer (essential for shooting aerial footage). Locking onto GPS signals is fast and reliable. The top speed of 35 mph is pretty average and ok for a camera drone. The 20 minute maximum flight time isn’t bad, but it’s not the best either. The good news is the battery charging time. It only takes about 1-hour, which is considerably less than much of the competition. The remote control (RC) has a clamshell design and is about the same size of an average video games controller. It has all the usual functions with the addition of audio cues, which is a nice touch. The controller contains a smart 5″ LCD FPV display with a resolution of 720p. Although it’s bright, I did find it prone to glare in certain conditions. It’s not a major fault as much as a minor distraction. The Karma doesn’t include a camera but has a harness to house GoPro Hero4 & Hero5. The Hero5 can shoot footage in 4k up to 30fps. The camera mounts on the drone’s nose rather than under its belly. The front position of the camera and its stabilizing gimbal makes this a very slim UAV. The GoPro foldable Karma actually closes down to the size of a water bottle making it a great travel companion. You can remove the stabilizing gimbal and use it with the Karma Grip (included). This flexible pistol design grip is perfect for when you want to shoot ultra-steady (non-aerial) footage by hand. The video and photographic quality, though, depends on the camera mounted to the Karma quadcopter. The entire karma drone kit fits neatly into a smart outdoor travel case (included). I endorse this drone, but it won’t suit everyone. The rather short flight time is one of the major setbacks for a camera quadcopter. Plus GoPro cameras are not the preferred optics for everyone. All in all, there’s more to like than dislike. The lugability factor is a major plus point for me. It’s a nice flyer too and provides an enjoyable experience for any serious beginner or seasoned prosumer. The table above should help you decide whether the GoPro Karma checks enough of your boxes. There are some very capable crafts for under $1000. These are camera drones at the serious end of entry level. Many of you reading these reviews have most likely had some flying experience. Are you enthusiastic about creating beautiful aerial photography and stunning video? 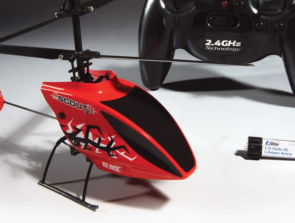 You can certainly find something among these four quadcopters to meet your expectations. The Autel Robotics X-Star Premium is a fun and easy to fly camera drone for anyone at any level. It’s not a name you hear alongside giants like Yuneec or DJI, but don’t let that small detail put your off. 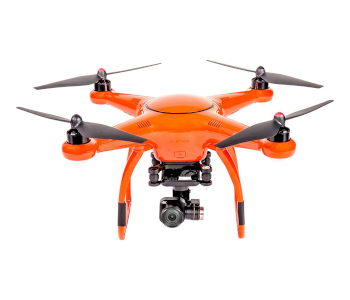 You may have heard X-Star Premium referred to as ‘The Flying Pumpkin’ because of its bright orange color. This can be a good thing as it’s so easy to lose sight of lighter colored drones. This is yet another camera drone with an effective Beginner Mode. It’s useful because it limits distance, speed, and altitude. Once you become more confident you simply move away from the learner mode. The hands-free hover is a popular feature which kicks in the second you take your hands off the controls. Another failsafe aspect is the return to home feature when the battery starts to get low. The design of the X-Star Premium is not dissimilar to the DJI Phantom 3, but it’s a different craft with its own personality and flying experience. There’re a few gripes with take-off and landing, though. Some users report wobbling as the craft takes off and lands. There are very few complaints once the drone takes to the skies. It’s a great flyer and easy to handle once you become familiar with it. Under ideal conditions, you get a reasonable 25 minutes of flight time with a single charge. The battery only takes an hour to recharge so that’s another big plus point. Autel Robotics X-Star Premium remote controller (RC) has command sticks to help improve grip and therefore confidence when maneuvering the craft. It also includes a training cable for flight lessons. To use the remote controller you have to attach a tablet or smartphone to its clamp. You’re then set to enjoy the HD live-view direct from the drone’s camera. The custom built camera of the X-Star Premium is impressive. It can take Ultra HD 4K video and still photographs up to 12MP. You can detach the camera from its fast-release 3-axis gimbal stabilizer. We all want crisp rich colors from our camera drones and this one doesn’t disappoint. The wide-angled lens gives you a 108° field of view (FOV) which is perfect to capturing plenty of footage. Camera options for stills photography include burst shooting (3/5/7 seconds). There’s also various time-lapse options and Auto Exposure Bracketing (AEB) modes, saved as JPG or DNG formats. You can slide the camera’s gimbal off with the quick push of a button. It’s a useful feature because as the payload technologies develop you’ll be able to upgrade the camera with a minimum of fuss. I have to highlight a couple of negative points with the X-Star Premium. One is that it’s missing effective landing gear. Another common complaint is that the after sales support is below par. All drones have a few minuses. Some of these depend on the user’s personal preferences and expectations of course. Overall, this is a savvy camera drone that’s unique, robust, and consistent. I particularly like the autopilot functions, 64GB storage card, and one-touch buttons. The nice quality, splash-proof, shock-absorbent carrying case with foam interior is a real bonus. The DJI Mavic Pro is not only a superb flying camera—it’s easy to operate too. This makes it a winner with beginners and prosumers alike, but there’s still plenty to learn to become a “skilled” pilot. The Mavic’s a natural in the sky and flies without effort. It’s fast — if you want speed — and it’s responsive, acting on your input right away. It ascends and descends with impressive precision as well. This lovable little AUV gives you 27 minutes of flight time under ideal flying conditions. And if you want to reach those places that few people ever get to, you’ll love the remarkable 4.3 mile flight range. Add to these impressive features a short 60 minute battery recharge time and you’ve got a serious contender. It’s small, it’s luggable, it’s light, making this a traveler’s dream craft. With this tiny quadcopter comes Mavic’s little remote controller (RC), but don’t let its size fool you. It folds down just like the drone. Unfold it to house your Android or Apple smartphone in its secure grip. Your mobile device connects to the controller via a short cable. Once attached the RC connects to the DJI Mavic via RC or WiFi. That’s it. You can now view the camera’s live feed in crisp 1080p. The 64GB microSD card gives you plenty of storage, and that’s always a good thing. You can block the sun or other interfering light sources with an affordable Mavic lens hood. It does a great job at preventing lens flare and glare. It may come into view when pitching in Sports Mode, though. There’s an effective miniaturized 3-axis gimbal that really does stabilize the camera. This ensures all your video and still aerial footage turns out crisp and clear with no noticeable shake. A lot of users love the gesture-control feature. Others find it a bit gimmicky. Being able to trigger certain drone functions — like taking photos — with a simple wave of the arms is pretty cool though. There’s so much to marvel at with the DJI Mavic Pro. Its video capability is what really makes this craft stand out for me. You can rely on a sharp 4K picture with stunning detail every time. First person View (FPV) using a headset is something every drone pilot should experience. Wearable goggles are getting better and more intuitive all the time, especially DJI’s own headset. DJI Goggles look bulky and awkward to the observer. Looks are deceptive! The headset is incredibly comfortable and gives you a bird’s eye view of the world from above. You have to see it to believe it. One gripe with this drone is also one of the things I love about it. I’m talking about the small size and light weight. Windy conditions can sometimes cause shuddering and mess with the flight plans. Another minor annoyance comes from the drone’s portability—another feature I love. The problem with being this portable means there’s not very much ground clearance. Still, we can’t have it all ways. 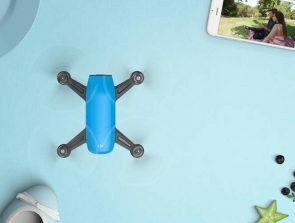 Altogether this is a clever camera drone with a lot of smart features. The obstacle avoidance is pleasing, especially when you consider there’re plenty of models out there that still don’t have it. If bigger means better to you, then skip the DJI Mavic Pro. If your priorities are with portability, maneuverability, long flight times, and fast charging, put this capable craft onto your short list. High winds can mess with flight and filming, despite the gimbal. The DJI Spark can make a great quadcopter for a beginner, but there’s more of a learning curve compared to other models in this guide. This is due to its all-inclusive control system. Like the DJI Mavic Pro above, the Spark is also incredibly portable and lightweight. It only weighs 300g. It’s a nice flyer too, and its gesture-control functionality makes it even more popular. The maximum flight time of 15 minutes is something of a letdown. The battery recharging time is around 90 minutes. That’s a fairly decent average. This is still a very worthy craft with plenty to offer. You don’t get a remote controller with the standard kit, but you don’t need one. You can use popular tablets and smartphones to operate the quadcopter. There’s also the handy gesture control feature. You can buy the Spark Remote Controller as an optional extra if you want one. Aside from being a different way to fly the craft, this controller does provide other benefits that may interest you. For a start, it has a video transmission range that takes the drone further. 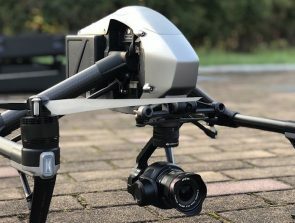 DJI says you can fly up to around 1.2 miles (2 km) with the gimbal camera. It’s a bit faster too, but that’s about it. There’s no 4K but it does come with a capable camera that promises to deliver stabilized video and fantastic still images. The camera films in FHD 1920×1080 at 30fps and doesn’t disappoint. The Spark sports an f/2.6 aperture wide-angled lens with a comparable focal length of 22mm. The camera itself has four impressive flight modes to explore. They call these Quickshot. This is another drone that shares a downside with one of its highlights. The tiny size makes it incredibly luggable but it also means it’s more vulnerable than bigger crafts in blustery conditions. You can control and launch the DJI Spark with hand gestures. Although hand control is a main attraction, there are many other features packed into this tiny, yet competent quadcopter. I’d say this is the perfect drone for casual fliers who want to capture their fun times. It’s not as attractive to more serious videographers and photographers at the prosumer level. 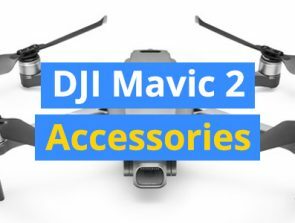 Okay, so it lacks some of the features of the costlier DJI Mavic Pro. But you have to take into consideration its price tag. At the time of writing, you’ll spend almost half as much on the basic kit. This short review along with the table above will surely help you to decide. The three camera drones in this section are half the cost or less than the ones at the top of the list. Although they’re basic entry-level UAVs, I can promise you they provide a lot of bang for your buck. Consumer drones are getting cheaper yet better at the same time. There are some poor models around, but they haven’t it made onto this list—obviously. 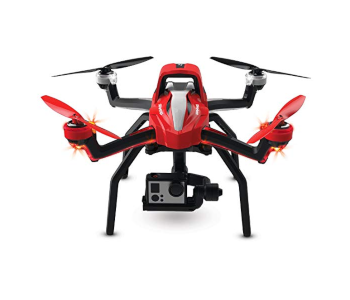 Here are three powerful quadcopters, packed with useful features and intuitive controls. For less than 500 bucks you get good flight performance along with photo and video quality to make you proud. The first drone in the under $500 category is the Traxxas Aton Plus. It’s a fun quadcopter to fly whether you’re a novice pilot of a seasoned expert. The current price is a little over 300 bucks. There’s nothing complex about preparing this craft for flight. The simple display of controls makes everything easy to grasp from the get-go. Just plug in a charged battery and turn on the controller. You’re ready to fly as soon as the four green LEDs light up. And don’t worry about the dreaded flyaways if you’re a new pilot. The Aton Plus has a safety feature to prevent this from happening. Newbie pilots should stay with Film Mode before they advance to Sports Mode. You’ll intuitively know when the time is right to explore the other options. The Expert Mode is where the real fun begins. You can capture stunning photos and video with this drone. There may come a time when you want to have fun as well as film. Expert mode lets you perform thrilling aerobatic feats at high speeds. Don’t worry if things get too hair-raising as you have air breaks to fall back on. These stop the drone in its tracks and bring it to hover-mode. Safety measures aside, this mode is still for experienced pilots. The maximum flight time of 25 minutes is impressive. There are drones with longer battery lives, but this is pretty darn good for a UAV at this price. The control range is less impressive at just 152m. Using the basic settings you have a quality quadcopter that’s easy to keep in vision and simple to fly. It offers a nice stable flying experience too, which is what you want for recording footage. Although this craft comes with a 2-axis fixed camera gimbal, you have to provide the camera. This is an extra cost if you don’t have one, but not if you already have a compatible GoPro action camera. The remote controller is lightweight and fits snugly in the hands. It comes with a few useful extras like spare thumb pads and control sticks to choose from. These little extras make a nice touch. The intuitive displays are easy to learn. You’ve got current flight mode, an indicator for the RC’s battery level, and the throttle rate. There are a couple of AUX modes too; flips, rolls, and brakes. To operate the drone you need to download and install the smartphone app, Traxxas Flight Link. Like everything else, the app is pretty intuitive and gives you options to customize certain flight settings. There are good news and bad news about First Person View (FPV) capability. The bad news is that there isn’t any. The good news is that the company has promised FPV in a not too distant future upgrade. One of the many things l like about this drone is the control you get as a user. It works well with both Android and iOS devices. You can change the app’s default safety settings as you get more experienced. Another nice thing about this company is that they don’t simply produce a product and leave it at that. They’re always looking for ways to upgrade this drone to provide even more fun features for flyers. If this was an expensive UAV I could list a few gripes. For the money, though, there’s not much to complain about. Yes, it would be nice to have a camera, or at least an option to buy one in a bundle. I wouldn’t simply buy the first compatible action camera I came across. My advice is to read reviews. See what experiences others have had with their choice of camera for the Traxxas Aton Plus. Some complain that this drone is a bit toy-like—not in ability—but in appearance. I agree. But when all’s said and done you have to weigh up what you get for your buck as well as what you don’t. The Parrot Bebop 2 is a camera drone that looks different to a lot of UAVs out there. It’s a design that you’ll take to or you won’t. Looks aside, what we have here is a great flying craft suitable for any level. Unlike the Traxxas Aton Plus above, you don’t have to worry about a camera. 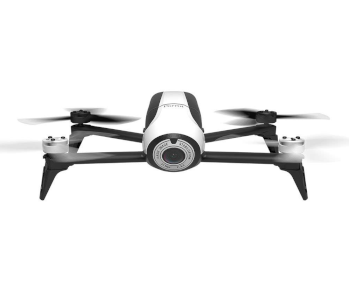 The Bebop 2 comes equipped with its own front-facing camera complete with a 3-axis digital-stabilization system. You certainly won’t lose this craft with its maximum flight range limit at just 300m. It’s a nice flyer though, and you can keep it airborne for around 24 minutes in ideal conditions. Another notable plus point is the fast battery charging time of just 55 minutes. If you’ve never owned a consumer drone before, just know that flight time and battery charging times can be real headaches. You may not think 24 minutes is long, but in the drone world, it’s on the high side of average. From a camera perspective, you get decent optics and some nice recording options. Alas, it’s not an upgrade. This is the same camera found on the earlier Bebop with 14MP stills and video at 1080p. An f/2.2 fisheye lens provides a 180-degree field of view (FOV), though it’s a bit vulnerable to damage. I recommend fitting a lens hood to help protect it against collision. It’s a smart move to take! The footage is perfectly acceptable for most owners despite the lack of 4K video. After all, for movie-quality recordings and features, you have to step up to the next level of camera drones. The Parrot Bebop 2 will satisfy the majority of new fliers as a first drone. The camera side of things may disappoint those who’ve already experienced exceptional video quality with other crafts. There’s no removable storage option. I wouldn’t usually complain about this if there was plenty of fixed storage space. There’s not. And it doesn’t take long to fill up 8GB when shooting 1080p video. There’s something you need to know before you jump to the next drone. The Sky Controller offers much better communication and controlled flying experience than a smartphone. That means smoother flights over longer distances. The controller is quite bulky so it makes things less portable. The point is you have the option to take it with you or not. You can decide when it’s best. If you buy the bundle (recommended), you’ll have a lot of fun with the FPV Parrot Cockpit glasses. You will have to use your smartphone as the display screen but it’s a hassle worth having. If you’re more interested in flying experiences over photography and video, put the Parrot Bebop 2 onto your shortlist. If you’re more serious about the quality of your footage, explore the other options. Extra points to consider: the Bebop 2 is a fixed-wing quadcopter. Its controller is good but quite bulky. And the built-in camera sports a fisheye lens. Do you want to capture that much view? Summing up this is a decent flying camera with a lot to offer. 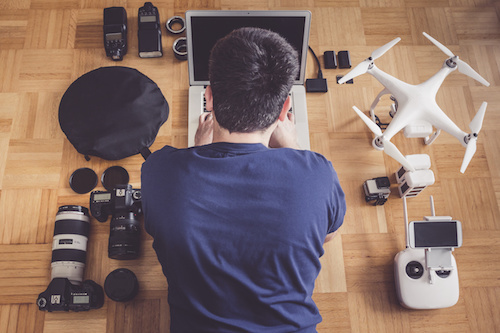 Whether it’s right for you or not depends on what boxes your next camera drone has to check. 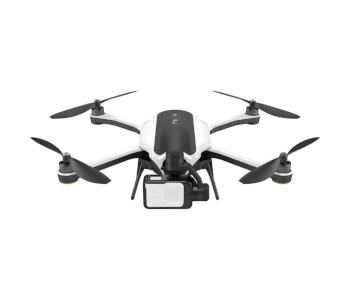 The 3DR Solo Drone is a smart UAV that provides an enriching experience for any pilot. The crafts autonomous flight modes make it a real winner with beginners and prosumers alike. Keep reading if you want exceptional videography and aerial photography at an affordable price. For the money, the Solo smart drone doesn’t disappoint, not in flight performance or footage. There’re also the safety features—welcome with any drone. The Return to Home is one, and the virtual safety net is another worth noting. With the latter, you draw a virtual fence around the flight area. I’d say the 3DR Solo provides the best ever flight experience for a drone in its class. It’s both straightforward and easy to grasp thanks to the autonomous flight modes and smart controller. You get a decent flight time of 25 minutes in optimal conditions. The battery takes about 90 minutes to fully recharge. It’s always advisable to take a spare or two if you need to be airborne for a good while. The 3DR Solo doesn’t come with a camera. If you already have a GoPro Hero model 3, 3+ and 4, you’re in luck. If not, you’ll have to factor the cost of a camera into the price. GoPro action cameras are well-known and capable of producing exceptional results. You can also snap up some great secondhand deals if you’re on a tight budget, either locally or on Amazon. There is an option to buy this craft with or without a gimbal (image stabilizer). Remember, the quality of your photographs and video are camera-dependent and whether or not you use a gimbal. Some users—especially new pilots—only look at the drone and give little thought to its remote controller (RC). This is a mistake. It’ll please you to know that the RC with the 3DR Solo is a beauty. The RC looks great, feels nice in the hands, and is ultra-responsive. It comes with its own little LCD screen that presents you with important data about the precise angle of the airborne craft. The controller has a casing to attach a smartphone or tablet. This lets you see what the drone camera sees. We call this the First Person View or FPV. It’s the ultimate way to fly and enjoy camera drones. A common complaint is that the Solo can drift a bit in hover mode. I don’t see this as a major gripe, not on the grand scope of things. The GPS can be a bit spotty at times. That’s a bigger nuisance. All things considered, the 3DR Solo is popular for good reasons. 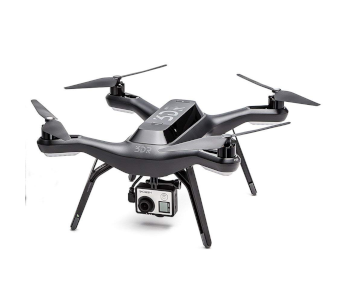 It has an affordable price tag, autonomous flight modes, first-rate technology, and flexibility to suit all levels. Good luck, and may all your flights be successful.